Coast to Coast Concrete Cutting and Drilling has specialized cutting, drilling skills and equipment. A long establish family business that has been handed on down to the next generation of specialty craftsman. A local family run business. 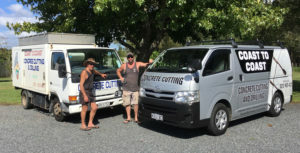 A local family run business that has been operating for nearly 20 years, Coast to Coast Concrete Cutting and Drilling has been serving the Far North since 1997. Originally owned and operated by Chris and Bruce Waugh, the company developed over the years to pride itself on its customer service. Bruce Waugh’s flexibility and expertise has been ingrained in the company’s ethos. The high standard of workmanship and professionalism continues to be the centre of the business today. 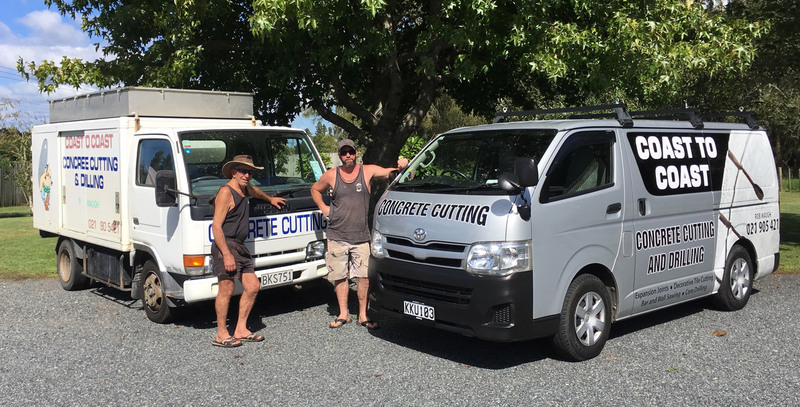 Coast to Coast Concrete Cutting and Drilling was bought by Rob Waugh and his family in 2012. It services many areas in the Far North, from the Hokianga in the west to Kerikeri in the East. Much of our work is centred around the central Far North in areas such as Kaikohe, Kawakawa, Paihia, Mangonui and Okaihau. Our work varies from residential work through to the large commercial jobs.